NEW YORK News Corp. (NWSA) will formally split in two after the market closes Friday, with existing shareholders getting one share in the new publishing entity for every four shares they hold in the media company. Since Wednesday last week, preliminary shares of both sides of the company have been trading as if the split already occurred. Any buyers of preliminary shares will receive them next Friday. Preliminary publishing shares closed Friday at $15.25. 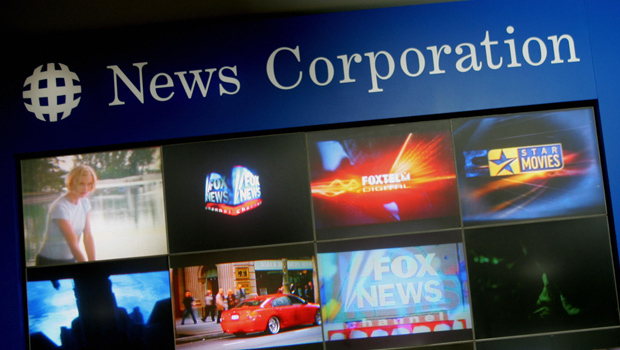 The recent trading valued the publishing division, to be named News Corp., at around $8.8 billion. That's about 12 percent of the entire company's value. It had a market capitalization of about $75.5 billion before the split. The movie and TV division is being renamed Twenty-First Century Fox Inc. Its preliminary stock closed at $28.99 on Friday. Shares of both entities will begin trading normally on Monday, with new News Corp. shares trading under the tickers NWSA for nonvoting Class A shares and NWS for voting Class B shares. Twenty-First Century Fox shares will trade under the tickers FOXA for nonvoting Class A shares and FOX for voting Class B shares. Rupert Murdoch, who will be chairman of both companies and CEO of Twenty-First Century Fox, will retain his grip on both companies by controlling nearly 40 percent of the voting stock in each. The split completes a process that the company announced a year ago and responds to investor concerns that the newspaper and book publishing divisions were dragging on the faster-growing pay-TV business. By separating, the publishing division can devote resources toward engineering a turnaround, while the Fox side focuses on launching a national sports network to be called Fox Sports 1 that will compete with pay TV leader ESPN.